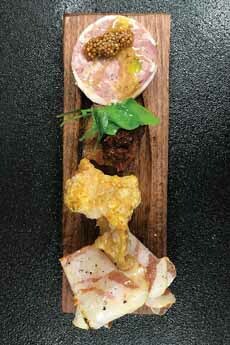 Consider a gourmet combination plate—a pork version of a pu pu platter*. This idea was inspired by steakhouse Rare Steak and Seafood in Washington, D.C. (photo #1). Chicharrón (pork rinds), the skin with dried yellow chile. Lardo, pork fat with salt. Pork belly with black peppercorns and mustard. Pork pâté with nutmeg and brandy (pâté campagnola in Italian, pâté campagne in French). 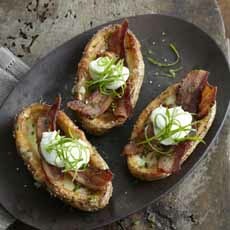 The combination provides four different texture and flavor experiences. You can serve a pork variety plate as a first or second course, depending on the size of the portions. You can also purchase some of the ingredients, such as bacon jam, dumplings, fried pork rinds, meatballs pork sausage and pulled pork, among others, can be purchased. While there are many, many pork dishes, select four or five that can easily be served in neat portions on a combination plate. Pulled pork sliders work, pork stew doesn’t, unless you serve it in a ramekin to hold in the juices. Here are some ideas for your combination plate. CHECK OUT OUR PORK CUTS GLOSSARY. *A pu pu platter is an assortment of Chinese restaurant appetizers, is fun—and sounds so much more interesting than “assorted appetizers.” Here’s more about it. †Pork loin and pork tenderloin are not cut from the same part of the animal, and in fact, look really different — pork tenderloin is thin and small, while a pork loin is wide enough that you can cut steak-like pieces from it. Gourmet pork combination plate from Rare Steak and Seafood in D.C.: pork pâté, slow-cooked pork belly, chicharrón and lardo. 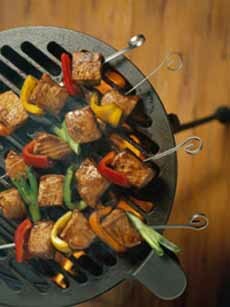 Pork skewers (photo courtesy National Pork Board). 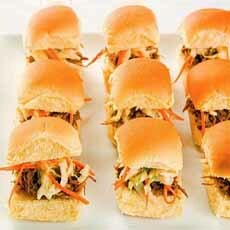 BBQ Pork Sliders (photo courtesy Pig Of The Month). 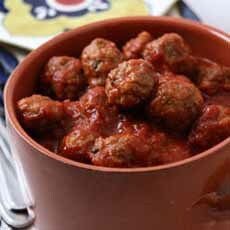 Pork meatballs (photo courtesy Frontier Fiesta). 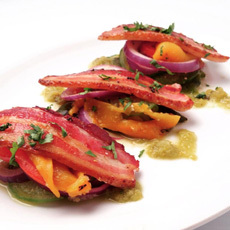 Pork belly on spicy tomatillo salad (photo courtesy Chef Eric B. LeVine). 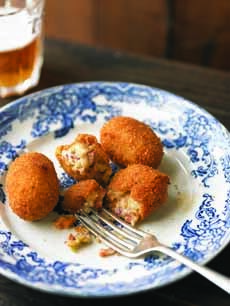 Ham croquettes (photo courtesy Kyle Books).